For the taco cookies, preheat the oven to 350ºF and line a large stainless steel baking sheet with silpat or parchment paper. Place the buttery sticks, sugar, and honey into a small saucepan. Heat over low heat until melted. Whisk and increase the heat a bit to allow the mixture to bubble up along the edges. At this point, whisk almost continuously for 1 to 2 minutes to allow the mixture to thicken slightly. You know the mixture is done when it begins to stick to the edge of the pan. Turn off the heat. Stir in the shredded coconut and sorghum flour until combined. Using a spring loaded tablespoon size scoop, scoop out dough (leveling it off with a butter knife). Place each scoop of dough onto the prepared baking sheet about 3 inches apart. Bake for 8-9 minutes. The dough will completely flatten during the last few minutes of cooking. The cookies are done when the entire cookie (especially the center) is golden brown. Remove the baking sheet from the oven and allow the cookies to cool for 2-3 minutes on the tray. Have a rolling pin or a wooden spoon handle measuring 1" in diameter ready for use. Using a thin, metal spatula, carefully lift the cookie from the tray and drape it over the rolling pin. Allow the cookie to hang in place for a minute to harden. Transfer to a cooling rack. Please note: if the cookie begins to scrunch up and gather when trying to lift it off of the baking sheet, you should allow it to rest for another minute and attempt again. For the ganache, place the coconut milk into a small saucepan and bring to a simmer. Turn off the heat. Stir in the lime juice and chocolate chips. Stir constantly until all of the chocolate is melted and a silky ganache has formed. Invert two standard size muffin tins. 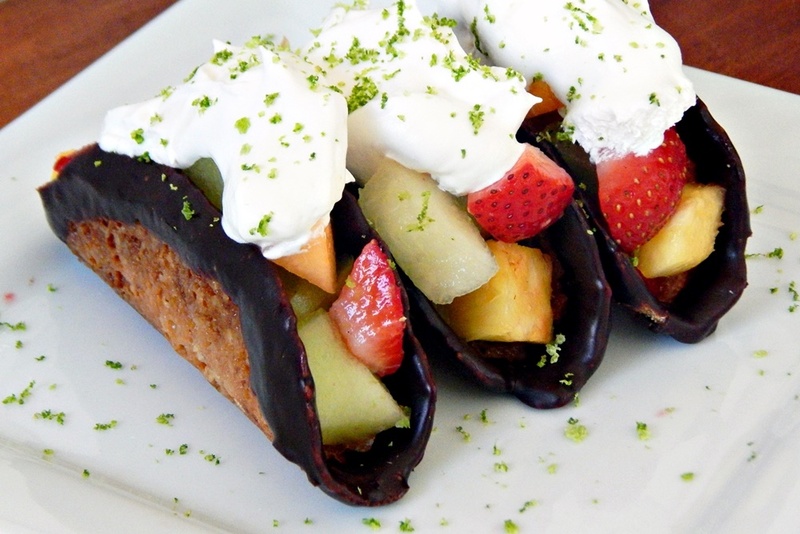 Take each cooled thin taco and dip the edges in the ganache. Place right side up in the grooves of the inverted muffin tin. When all the taco shells are completed, place the tins in the refrigerator for 30 minutes to allow to set. For the topping, stir the lime zest into the CocoWhip. Remove the taco shells from the refrigerator. Fill with the fresh fruit mixture and top with a dollop of lime CocoWhip. Place the remaining chocolate ganache in a bowl to allow people the opportunity to drizzle more ganache on their taco.